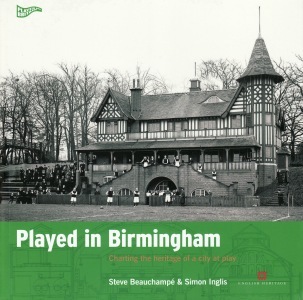 Played in Birmingham is the fifth book in a groundbreaking English Heritage series celebrating Britain’s rich and diverse sporting heritage. Lavishly illustrated and adopting a completely new approach to the study of sporting and urban history, Played in Birmingham leads readers along a trail of fascinating locations and little known buildings, landscapes and waterscapes, in all corners of the city and its surrounds. Birmingham is a city founded upon hard work, enterprise and civic pride. Its stock of historic public baths includes three of the oldest operational swimming pools in Britain. In 1888 a Birmingham draper was responsible for setting up the Football League, the first in the world. Birmingham also has a proud record at grassroots level. Following on from the pioneering example set at Bournville by the Quaker brothers, George and Richard Cadbury, during the early 20th century Birmingham industrialists invested in a network of sports facilities for their employees that gave rise to the largest works football association ever known. Birmingham was the cradle of lawn tennis, in the 1860s, and the setting for the world’s first snooker championships, in 1927. Its numerous workshops have also been responsible for supplying medals, cups and trophies for generations of international competitions, plus no fewer than 200 million Acme Thunderer whistles, the first choice of referees around the world since 1884. For those who do not know the city, or perhaps dismiss it as a mere concrete jungle, Played in Birmingham also reveals a wealth of green space – parks, golf courses, cricket grounds and bowling greens – several barely more than a mile or so from the Bull Ring. Perhaps even more surprising, Birmingham’s topography is interlaced with rivers, brooks, lankes and pools, with Edgbaston Reservoir forming one of the great waterscapes of urban Britain – a magnet for anglers and sailors alike. This is a book full of delightful surprises and quirky details, many of which are little known, even within the Birmingham area. There has never been a history of the city quite like it.